PSALMS 26:2 KJV "Examine me, O LORD, and prove me; try my reins and my heart." 1(A Psalm of David.) Judge me, O LORD; for I have walked in mine integrity: I have trusted also in the LORD; therefore I shall not slide. 2Examine me, O LORD, and prove me; try my reins and my heart. 3For thy lovingkindness is before mine eyes: and I have walked in thy truth. 4I have not sat with vain persons, neither will I go in with dissemblers. 5I have hated the congregation of evil doers; and will not sit with the wicked. 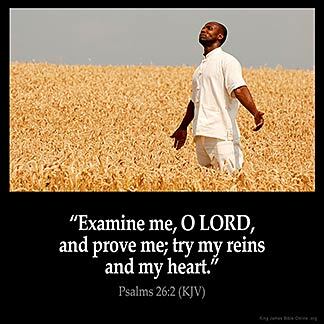 Examine me, O Lord, and proue me; try my reines and my heart. Examine me, O Jehovah, and prove me; Try my heart and my mind. Put me in the scales, O Lord, so that I may be tested; let the fire make clean my thoughts and my heart. Examine me, Yahweh, and prove me. Try my heart and my mind. Try me, O Jehovah, and prove me, Purified [are] my reins and my heart. Examine me, O LORD, and try me; test my reins and my heart. Praise The Lord our God amen. This verse is not to be taken lightly. To ask the Lord to examine me and try my heart is very serious I must be prepared for the revealing of things that need to be taken out of my life and replaced with new from the Lord !! To receive correction and possible chastisement . I must depend on my Lord to help me to rid myself of unclean actions and words in my life. The grace of my Lord God is sufficient . I will and can do all things through Christ which strengthens me. Amen !!!! Examine Prove Try Am I ready for this !!!!! David was asking the LORD to check him out, and what the true motives of his heart or mind were. We need to be in his same position. We don 't want to be a fake, but follow God for genuine reasons, not just for show.